What if you prefer spreadsheets? The first time I created an invoice for my clients… I just didn’t. All I wrote was a simple email with a summary of blog posts or text translations I had written for my client, the price per post or translated piece and the PayPal ID to pay me to. Emails like that were part of the conversation with the client, so while they were still proof that a payment was owed for my services and they could work like invoices, they were a real pain to handle and keep track of. The whole thing got messy over time, when I had to collect a year of ‘invoices’ to make the point of the situation with the client, until I had to go back to PayPal transactions to find what had been lost in the email archives. And I couldn’t afford invoicing systems like Freshbooks, so I had to look for free or open source alternatives. You bet? I found some that would email the invoice directly to my client and they have nothing to envy to other premium invoicing tools. Following is a mini review of my 3 favorite invoicing tools — one free, two open source — that I use with my clients — plus a bit of advice. Note: All clients, rates and details in the invoices below are either used as an example or are fictional. They do not reflect reality. Free, friendly, a kind and helpful support team, an overall pleasant-to-use free invoicing tool. This is the invoicing system I currently use with Bosmol and other clients. The learning curve is almost non-existent — you can simply register to the service and start using it right away. 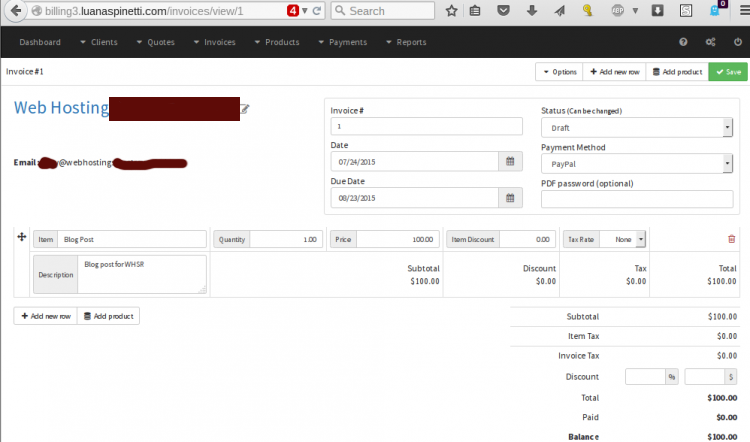 InvoicePlane is a self-hosted invoicing tool (that means you will download the software and install it on your website) that comes with a simple interface, colored labels and, like Invoiceable.com, an almost non-existent learning curveuse. The software provides colored labels for Draft, Approved, Rejected, Viewed, etc. invoices and it only requires a few steps to create a professional yet minimalist-looking invoice. 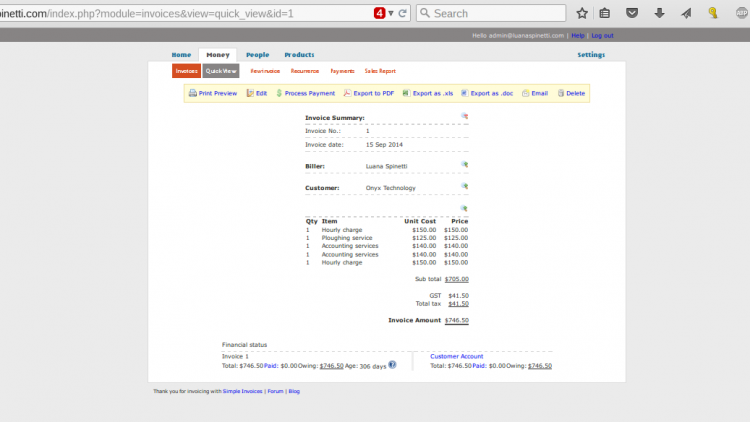 You can also view payments, configure product families, create or view quotes and so on. Load URL/setup in your browser and follow the instructions. You will have already created a MySQL database for it (if you haven’t, do that before you proceed), so you will only need to input database and admin information as the installer asks for it. Once you are logged into the invoicing system, configure your Settings and then add your first Client — that will be enough to create your first invoice. I haven’t used InvoicePlane as massively as I’ve hoped to, as I’ve been sticking to Invoiceable.com for a long time and my website server has had issues over the past year. However, InvoicePlane is definitely my second choice in this sense, so I would use it whenever Invoiceable isn’t available to me under certain circumstances. 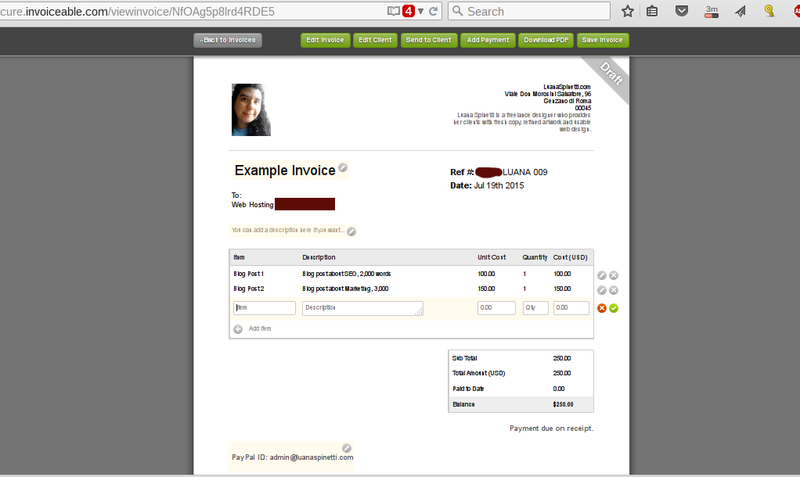 I use this on billing.luanaspinetti.com, as SimpleInvoices is self-hosted software like InvoicePlane. It has a more professional, less intuitive interface, but still easy enough to use. It just takes a bit longer to configure, but the Settings are well structured and not a headache to go through. Here is a list of freelancers who share theirs — for free — either as downloadable Excel or PDF files, or tutorials. Carrie Smith from The Write Life shares the basics of a good invoice for freelancers and solo businesses. Also, there’s an invoice guide for freelance writers at About.com. 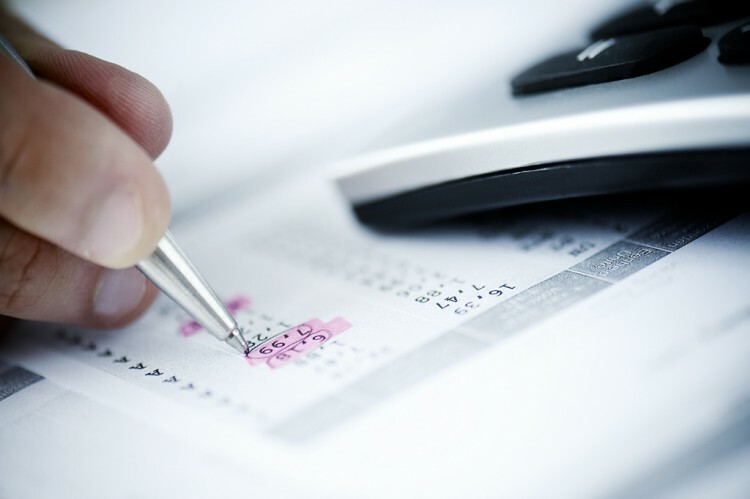 What invoicing system or tool do you use with your clients? Win a free pass to #SMWF N. America! Motor Mate App, Are You A Good Driver?